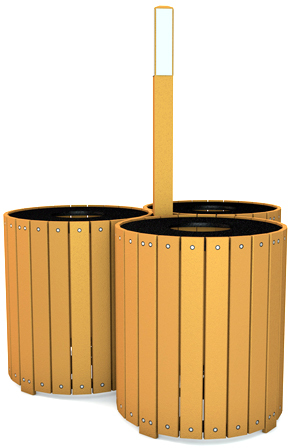 Constructed of 32 gallon standard round trash containers made with 1" x 4" recycled plastic Resinwood slats around a 4" x 4" center post. Each container is engraved with the label of your choice: glass, cans, aluminum, plastic, bottles or paper. Center post is clearly labeled with "recycle" to complete the recycling center. Center post can be anchored into the ground or cut off and surface mounted. Liners not included. Lid color is standard green. Recycled plastic Resinwood available in colors shown below.